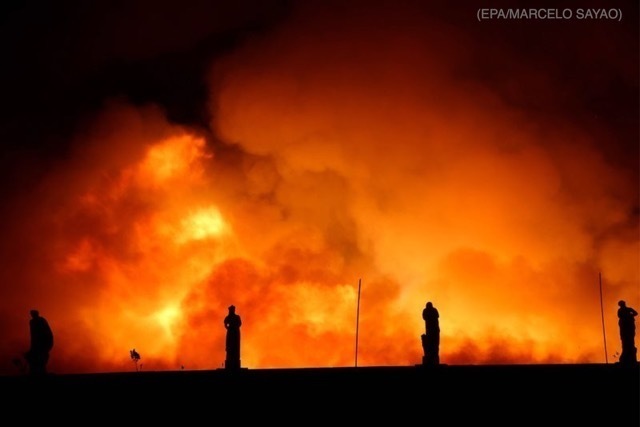 The September 2 fire that gutted the two-century-old National Museum of Brazil in Rio de Janeiro destroyed an estimated 18 million artistic, historical and scientific artifacts, ninety percent of the total holdings. The lost treasures include: the oldest human skeleton found in the New World, the Paleolithic “Luzi,” or Luzia Woman, 11,500 years old; fossils of Angaturama limai, a Cretaceous crocodilian with a sail-like spinal fin; and relics from Pompeii, Egypt, and the pre-Columbian Inca and Nazca cultures, some now extinct, including a Chilean mummy at least 3500 years old. Brazil’s president lamented, “Two hundred years of work, research and knowledge were lost.” One scholar compared the disaster to the burning of the Greek Library in Alexandria, Egypt, in 48BCE, still lamented by classicists; another called it “a lobotomy on the Brazilian memory.” While the cause of the Rio fire remains unknown for the moment, it is clear that inadequate funding for the building’s security was a major factor. Fire hydrants and smoke detectors failed, and despite heroic measures by museum staffers and local firefighters, all but a fraction of the collection was destroyed—and, although irreplaceable, uninsured. The government, which after years of neglect (in favor of other projects, in a recession), despite repeated warnings, and had recently—and in retrospect, ironically—allocated funds for upgrading the infrastructure, has promised to rebuild the museum “from ashes,” housed since 1818 in the former Imperial Palace. As I was reading about the Rio fire, and formulating my own thoughts, I ran across an article online by Skip Colwell, lecturer on anthropology at the University of Denver, “Lesson from Brazil: Museums are not Forever (TheConversation.com/us). Colwell beat warns us about the fragility of cultural institutions, pointing out that museums face perils every day, despite their imposing architecture and air of authority. “The museum aspires to be a fortress against time. The reality is that time is inescapable and relentless. Museums are locked in a constant struggle against decay and an almost absurdly wide-ranging array of natural and human threats.” These threats include collateral damage from war and opportunistic looting; theft for the black market; ideological cleansing; and environmental change. And even absent such dramatic catastrophes as the 1865 fire that devastated the Smithsonian Institution in Washington DC, there are always the ravages of climate and time, and the war against those depredations is not cheap. The indifference (and sometimes ignorance) of officialdom comes at a price, as Rio demonstrates. The Trump administration, no friend of education or culture, according to Colwell, seeks to eliminate funding in 2019 for the National Endowment for the Humanities, the National Endowment for the Arts, and the Institute of Museum and Library Services, which are already financially stressed. Educated, intelligent people have thus yet another reason to bestir themselves to vote in the millions in November; no partisan replays of 2016, please. As the apostate fireman, Montag (the successful ‘woke’ rebel, a bookend to Orwell’s broken bureaucrat, Winston Smith) discovers, in Fahrenheit 451, you don’t miss your water till your well runs dry.